Soapwalla’s Deodorant Cream is all natural and uniquely powerful, utilizing superfine vegetable powders and clays, as well as lavender, peppermint and tea tree essential oils to absorb moisture, discourage bacteria, and ensure a long-lasting and highly effective experience. The frosting-like consistency allows for easy application and rapid absorption, and is ideal for all skin types. I absolutely love this deodorant! It smells soooo good and goes on really easily and doesn't leave residue on your fingers. It's not an anti-perpsperant, so you will sweat, but at least you'll smell good! There is no better deodorant on the planet. Even through hormonal changes, this stuff works! LOVE THIS STUFF!! I got it on an auto fix and it is amazing. Knocks Tom's out of the picture. Thank you! This deodorant cream is amazing! At first I was skeptical, because shouldn’t deodorant come in a stick to rub on. This cream you put a little on your finger and then rub on your arm pits. So the application is different, but it works really well. This is the second container I have ordered. Love it! This one really needs to get more than 5 stars! I live in the Low Country of South Carolina. The summers here are harsh, when I first step outside in the morning, I have instant sweat. I normally buy the "clinical" strength deodorants, but I always have to add more as the day goes on. With this deodorant I never have to do that! It is a bit odd putting it on with my fingers, but it doesn't matter to me because it works so well! I would definitely recommend this to everyone! I got this one month in my Mighty Fix and decided to try it a few months later. I absolutely love it. Best "natural" deodorant that I've tried by far. It's even working in the 80-90 degree heat that we're having. I definitely recommend this product. I've tried so many natural deodorants I didn't have much hope for this one, but I have been very pleasantly surprised. I love the texture and consistency of the cream and I like the experience of applying it. The natural sticks are so dry and kind of painful to rub on, but this one acts like a moisturizer and the deodorant feature works pretty well. I live in Texas where it gets into the upper 90s on summer days, and so far this cream has kept my body odor at bay. There were maybe two times when I felt like I might need a re-application but overall I love this product and will keep buying it. I received this as my Mighty Fix and I’m so glad it was chosen for that month! This stuff is fabulous! I’m happy enough to switch from Primal Pit Paste. Both brands are fabulous, leave me stink-free, and cause no irritation to my sensitive skin. The Soapwalla, however, is a softer texture that is easier to spread on my skin. Also, the Soapwalla leaves no residue after showering. It washes off very quickly (which is why I don’t mind the jar as the deodorant is easy to wash off my fingertips). I was not looking forward to this shipment of the MightyNest but I have been converted. This deodorant is the REAL DEAL! My skin is somewhat sensitive and I have latent allergies that just pop up, so the thought of a skin cream with clay and oils had me skeptical. So far, I have used it for a week. Now, I work out... hard! Stink is a way of life. But after a 90 minute martial arts class with extra time on cardio, still no stink! AMAZED! The initial scent from the oils fades very quickly and there in no residual color. This product is wonderful and I will promote it to all my friends. I received this in my subscription Mighty Fix. I admit that I was skeptical of the ability of a natural deodorant. Even with regular Secret antiperspirant/ deodorant, sometimes at days end, my armpits do smell. So I waited until the weekend to try this product, expecting to have even more armpit smell with it. But I am happy to say that it works really well. After trialing it over a few weekends, I am now ready to use this on a daily basis. Thanks Soapwalla and Mighty Nest!! We tried this version after using the sensitive one for a while and this one works much better for us! It smells of tea tree oil, which I find refreshing. What amazed me: I used it before heading out on a hot day for long bike ride in my synthetic shirt. At the end of the day, my shirt didn't smell. At. All. I couldn't believe it, because I have used many different types of deodorants and they've always stunk up synthetic shirts. This deodorant WORKS! I have been using the original scent for over a year now. I have tried at least three other "natural" deodorants and always end up smelling. I tried making my own even and ended up breaking out with horrible clogged pores in my armpits, but this product works and has not cause any skin issues. I just say I rolled my eyes when I got the deodorant in my mighty best subscription. Another deodorant that I would still start smelling with. I was wrong. While I'm not wild about hand applying it melting into my skin very quick. No residue left to get into my clothes. I don't smell even after a hot day in South Georgia. I feel dryer and so far no yellow sweat stains on my clothes. I have reordered the citrus sent. Y’all... seriously... I have tried sooo many natural deodorants, oil blends, you name it. Nothing ever prevented me from feeling like I smelled like a locker room by mid day, even the chemical-filled standard deos all over store shelves. I was pretty skeptical when this arrived in my MightyFix, but the first day I used it (which just happened to be the day we moved so I was super sweaty) I DIDNT SMELL AT ALLLL!!! It was amazing! I have used it for over a week and still love it! I hardly needed deodorant until I got sick recently...that left me scrambling for a natural product that actually worked!!! I'm a huge fan. If the many products I've tried, this is the only one that works!!! I've tried so many different natural versions of deodorant and they never worked -- until this one. I sweat a ton and have some synthetic clothes that used to get really stinky, but this cream works so well that I no longer smell and my shirts to get yucky like they used to. So happy I've found this stuff, worth the money! I was a total skeptic about deodorants, and had recently tried another brand. It wasn't bad but I still had wetness. Then I got a sample of this through Mighty Nest and I am loving this! Still some wetness with the sweat, but not near as much as before. No smell, and easy to use. Minus all the chemicals I had been using for years with antiperspirants. So glad I changed over and this made it easy! I'm not thrilled about having to get this on my fingers or the citronella fragrance, but it works so well I can't believe it! The fragrance fades quickly but this continues to work and work. Amazing! Absolutely Amazing - I can't live without it! This deodorant is the holy grail, folks. Just like many others here, I've tried soooo many all-natural deodorants but they either didn't work or created a nasty hurtful rash on my pits. But this Soapwalla Deoderant Cream is ::Gollum speak:: "my precious". I live in Central Florida and no matter what I'm wearing, I'm sweating before I even get to my car. This will not disappoint, folks. I was shocked when, after driving to work with broken AC in a long sleeve shirt and long pants in the summer, working in a hot restaurant for 8 hours, I STILL could not smell any b.o. Trust me, I stuck my nose in there good to make sure. Goes on smooth, doesn't irritate my skin, and the citrus scent is oh so yummy and pleasant. The original is a little more "herbal-mediciny", but it does the trick too, just depends on your preference. If I was on Survivor and could take only one thing with me, it would probably be this deodorant. Update: I have used this product for a year now and still love it and use it daily. I did experience redness and irritation like some others until I started gently dabbing the cream onto my skin. DO NOT RUB!! Just like all the other reviewers stated, this natural deodorant is AMAZING. I have tried so many brands and even made my own several times and never got such great results. It is not antiperspirant but any wetness dries very quickly and doesn't diminish the staying power. This is a must try! I live in humid South Florida. I need an effective product. But I am also concerned with commercial products and their toxic ingredients. So I have tried numerous of the natural products, heck, one still had aluminum! WHAT? None worked well -- I would start sweating or the smell was so awful I couldn't stand the scent of the product -- then it still didn't last long. Well, here's what I did. Based on reviews, I bought this jar AND another jar of another brand. I showered and washed the pits (Olive and Brad). When I was dry, I applied this to the left underarm and the jar of the other under the right. The next day, I did not shower. At all. I waited until that night, and I really got in there and stuck my fingers in the left side, and I smelled NOTHING bad AT ALL. Nothing. I couldn't believe it, I still smelled a tiny bit of product if anything. The right side did well but -- eh, not perfect. There was some stink. This product won, hands down. So I tried it again, only this time I put this product under the right arm just in case my right arm was producing more funk. Well, here's the REAL DEAL when last week, I was in a big hurry to get out of the house and, after showering, drying and dressing I had to put on deodorant. I didn't choose the natural because I have to dip a finger into it and smear it underneath my arm. That's all well and good on a typical day but I was in such a rush that I didn't want to have to wash or wipe my hands and I grabbed the stick of degree that I had been using before I received this natural deodorant. Went about the day / evening. The next day before showering, I decided to test. Nope. Both pits had odor. I couldn't believe it! So not only was I poisoning myself using this stuff, but it wasn't even the best solution? I am SO grateful to the people who stop and write these reviews because if not for them, I would not have chosen this brand. It really works for me so very well. I am a female and I do shave my armpits (well ..) so I can't tell you how well this works with wookie pits. But I can promise you that I have had no issues and plan to continue to use this. All of the other stick "natural" deodorants that I have tried (like 4 brands / types) continue to sit in my cabinet unused. I used to save them for days when I knew I would just be hanging out at home because they were not effective for that long. But this? This is great stuff. I trust it no matter where I am going, what I am doing and can finally - with confidence - toss the other natural stick deodorants out (wasteful, but, I will never use them). This stuff is amazing. And thank you to the person who called it "the holy grail of natural deodorants" because that really stood out, and it's why I purchased this product. I WANT TO ADD THAT I HAVE SENSITIVE SKIN! I am also very chemical sensitive to smells, I can't walk through a bread aisle in the grocery store at times when it's really acting up and it's hard for me to go out into public with perfumes and hair dyes -- and forget the laundry detergent aisle at a store ... This product does not bother me AT ALL. And I saw other reviews where people had sensitive skin and one got a rash, I would think that might be an allergic reaction because it has never bothered me at all. Even my allergist said my control scratches puff up like I am having an allergic reaction to nothing, that's how sensitive my skin is. So if you have sensitive skin but no allergies to the ingredients, you may still be able to use this. I have had no issues. I have also shaved and then used it when I get out of the shower, but I always wait until I am completely dry .. It's never been absolutely "immediate". But again zero problems with this irritating my skin. For those who do have sensitive skin and this product doesn't work, I think that this web site sells another brand in powder form that they have one for sensitive skin -- you can call customer service and ask if you want to try it. Seems to me I saw it recently but I love this so much, I have no reason to look elsewhere. I've tried other natural deodorants and was quickly becoming discouraged as none of them worked...until I tried this one. This deodorant works very well. It does feel a little gritty going on but I don't feel it at all after the application. It smells great too. I've been using this for a while (just ordered my 3rd jar...and it lasts a longtime) and I couldn't be happier! I've tried a plethora of natural deodorants over the last 3 years that couldn't handle my sweating + Atlanta's humidity. I would consider myself to have sensitive skin and at one point the deodorant did give me a rash the size of a nickel. However, I soon realized that I had made the mistake of applying the deodorant right after I shaved. It's important to wait at least 30 minutes before applying after you shave. Now my routine is to get the kids to bed, shower/shave, do laundry/read, apply the deodorant before bed, and reapply in the AM (when it's summer) so I'm smelling fresh ALL day. Oh my goodness!!! This is THE MOST AMAZING stuff! My husband and I hiked to Hanging Lake in Colorado over the weekend ~ it's one mile to the lake with a 1000 foot gain in elevation. WHEW! Up and down, and I was soaked, but I DID NOT SMELL!!! This product far exceeded my expectations! I will be using this every day! Love this product, works perfectly! This deodorant is life changing! I highly recommend it! I am 56 years old and have always had armpit body odor with everything I have tried. This Soapwalla deodorant is AWESOME - absolutely no odor and no aluminum chloride. Would recommend to everyone. BOOM! I purchased this deodorant for my 24yr. old son. He has tried many different products to combat odor and thought he was out of options. I read about and figured it was worth a try. So far, he is very satisfied with the results. I was looking for a deodorant for my preteen without all of the chemicals and it works great! My son and I also use this one and it works great for us also. It is easy to use and smells good. I will continue to buy it. This is the best deodorant I have ever used! I was worried I wouldn't like the hand application (as opposed to a roll-on or such) but it's totally fine. The product is not greasy. Easy to apply AND it totally works!!! Thank you Mighty Nest for teaching me about another product I need! I was sceptical of buying this product because in the past other all natural deodorant just didnt work. But this Works great, even in the hot summer days. Also smells great too. Will buy again! I know I would not have purchased this product, but I received it as part of my subscription. Surprisingly enough, I really like it. It is effective, it smells, good, and I believe it's better for me than standard deodorant brands. I have not really put it to the test, however, and used it on a really hot summer day. I suggest including a little spoon or scoop to get it out of the jar. It's a little difficult to get at without getting it under my fingernails. I will admit that I was skeptical at first, but after giving this a try, I am in love. Although it is a little messy, it's not a huge deal breaker for me. The scent is pleasant, not overbearing, and it lasts all day. I have been on the lookout for a new aluminum-free deodorant that can last through the day, and this is it. I'm so glad I got this in my MightFix! I received this deodorant as my MightyFix in March 2018. I was super pumped to receive it because I wanted to get away from my non-cruelty-free Dove. However, the idea of switching deos was a little terrifying for me, so it sat on a shelf for over a month. I finally braved up and I LOVE it. Love. The application process is a little weird but so easy. The scent is yum yum yummy and not at all overpowering. I will sometimes catch a little whiff of the deo and it makes me so happy (lol). It doesn't stop the act of sweating but it has fully protected me against any kind of odor. I have not tested it at the gym, but I've still gotten pretty active and gross at work and it has passed with flying colors. I wish that this deo wasn't nearly so expensive. Unfortunately, I can't justify the price, so I will have to find another cruelty-free option. Sadness. My husband has been really impressed with how well this works for a natural deodorant. He likes the creamy texture, uses it every day and it has lasted him all day. For me, I find that I'm still a bit smelly by the end of the day if I use it every day. But if I use it every few days, using other brands in between, it works better. We've been using the citrus version; will be trying the original to see if it's different. This deodorant works great if you are not sensitive to baking soda. Good moisture control compared to most natural deodorants. It worked great for a while then I started getting bad rashes. I've switched to the sensitive formula with no problems. 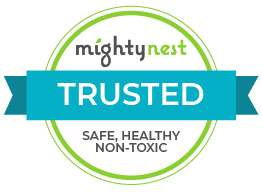 Wish Mighty Nest carried the sensitive formula. I have been disappointed with other natural deodorants as they don't work very well. This one keeps me smelling good all day and into the next. Even my kids think I smell nice! The paste is a little gritty, but it's not too messy to put on, and I am very happy with the results. I plan to have my teens start using this as well. This is the best natural product I have found so far, and I've used a lot of them. Just a small amount eliminates odor for hours. Sometimes I do find I have to reapply late in the day, but not always. Sweating is also much less, unlike the crystal type deodorant which eliminates odor but not sweat. It works well as a deodorant, but if you sweat a lot it won't help with that. I perspire way too much to only use a deodorant and need an antiperspirant. I got this in my June 2018 subscription and LOVED IT for several weeks. Then earlier this week I noticed my armpit skin was turning dark where I apply it to my skin - it doesn’t hurt or burn, just looks ugly! The same thing happened when I used another natural deodorant brand, so sadly I’ll be using it less. I am sorry to hear you are not satisfied with the Soapwalla deodorant. Sometimes finding a natural deodorant that fits your body chemistry can take a bit of trial and error. We have several other natural deodorants you can try, including the Thinksport Natural Deodorant and Primal Pit Paste. It seems like my review is in alignment with many of the others. Got this as part of my fix. It smelled great and seemed to work well but after 2 days I had a terrible rash. There must be some ingredient that my skin is sensitive to so I stopped using it. I'm also not crazy about a deodorant cream in general, would rather apply with a stick. Thank you for taking the time to review the deodorant cream! It's possible that you have a sensitivity to the baking soda or essential oils that are included in the ingredients. The deodorant cream application does take a bit to get used to. One of the benefits of switching to a deodorant cream in a jar, is that you will be able to use 100% of the contents. Typically, deodorant sticks are thrown away with 10-20% of their product leftover. To make the most of your deodorant cream, customer service will be reaching out to you directly with some tips and tricks. Thank you! I received the citrus version as part of my mighty fix. Prior to receiving this I had been making and using my own deodorant for several months, which is baking soda based, with zero issues. I like the lemongrass/citrus scent, and thought to give it a try because a) I thought it might help me refine my homemade version and b) since I have it why not use it. I had zero problems the first week or so, but through the second week I noticed a red rash and irritation in my armpits. I discontinued use of all deodorants until it cleared up. After it did I went back to my homemade version and had zero issues. I didn’t try Soapwalla’s deodorant cream again. I wanted to like, and still do like this deodorant, but developing a rash means I recommend with reservations and won’t purchase it for my own use. I like the smell, the texture, and it was effective with body odor. I don’t know why I developed the rash because I haven't had irritation issues with any of the ingredients in other products. I only attribute it to this deodorant cream because that was the only new thing (i.e. food, body care, cleaning, etc) in my life. I really was excited to try this deodorant cream. I really liked it and had no B.O. while using it. HOWEVER, it did darken the skin in my armpits. I didn't have any irritation, darkness almost like a bruise. I stopped using it and hope my skin will will return to its original color. I want to preface this with the fact that I have VERY sensitive skin. So sensitive that I cannot even use baby wash or lotion the majority of the time. The deodorant works very well. I've tried so many different brands over the years and they all left me sweaty and musky. I've been using this product for about 3 weeks now and truly believe that it works. However, unfortunately it highly irritates my skin to the point that my armpits are now bright red and look sunburned. They don't hurt or itch, which is odd, but they are not attractive in sleeveless attire. Sadly, for me, the search is still ongoing. This actually worked really great at deoderizing and keeping the sweat down. A little weird in the application but I could learn to deal with that. But, it started to give me a really bad rash under one arm so I had to stop using it. It last for most of the days. But, in the morning you stink. I have used many natural deodorants. This was just okay. I recognize that a "natural" item is going to react differently with different chemistries. This is one of those items. I read so many reviews that loved it, but I don't like anything about it--except the concept of less chemicals, that part is great. (Hence the two-star review, instead of one). I gave it a week. I didn't like the smell, I didn't like the texture, I didn't like how to apply it, and I didn't like that it "piled" up on my skin. I will say I did think it kept me odorless, but not confident. It just isn't for me. I wish I could send it back and get a refund for that month. We are sorry to hear you are not satisfied with the Soapwalla Deodorant. Sometimes finding a natural deodorant that fits your body chemistry can take a bit of trial and error. We appreciate you trying out a natural deodorant alternative. If you'd like to look into other natural deodorant options we recommend the the Primal Paste Baking Soda-Free Sensitive Deodorant Stick or the Weleda Spray Citrus Deodorant. After using this product for just three days in a row, I got the worst rash in both of my pits. I have never had that happen with regular deodorants, so the fact this happened with Organic/Vegan deodorant cream is strange. I don't have sensitive skin, nor do I have any major allergies, so this isn't normal for me. While it worked in terms of making me smell fresh throughout the day, I definitely cannot live with itchy armpits for the rest of my life. 2 stars because it did work, but just unfortunately gave me an itchy rash. We are sorry to hear you are not satisfied with the Soapwalla Deodorant. Sometimes finding a natural deodorant that fits your body chemistry can take a bit of trial and error. Most natural deodorants, including Soapwalla, use baking soda as a main active ingredient which can sometimes cause irritation on sensitive skin. There are some tricks that may help prevent irritation. You can soothe and moisturize your armpit skin after a shower with coconut oil, shea butter, cocoa butter (whatever your favorite moisturizer is). You can also try shaving at night to give your skin some time to adjust before applying deodorant in the morning. We appreciate you trying out a natural deodorant alternative. If you'd like to look into natural deodorants that don't contain baking soda, we recommend the Soapwalla Sensitive Skin Deodorant Cream, The Primal Paste Baking Soda-Free Sensitive Deodorant Stick or the Weleda Spray Citrus Deodorant. Just like other reviewers, this stuff gave me a nasty rash. And, I've never gotten a rash from other deodorants. I gave it two stars because it did seem to work, but I had to discontinue. We're sorry to hear the Soapwalla Deodorant Cream left you with a rash. Like many natural deodorants, Soapwalla uses baking soda as an active ingredient, which can sometimes cause irritation. You can sometimes thwart the irritation by moisturizing your armpits after a shower or shaving at night to give your skin some time to adjust before applying deodorant in the morning. Additionally, if you'd like to try out other natural deodorants that don't contain baking soda, we recommend the Soapwalla Sensitive Skin Deodorant Cream, Weleda Citrus Deodorant Spray and Primal Paste Baking Soda-Free Sensitive Skin Deodorant Stick. We hope this helps! I agree with the other reviews. This deodorant is amazing! No smell at all for someone who has never found a deodorant that works. The downfall is that after about a week this gave me a major rash. I am going to try the sensitive skin formula and hope that it works. I can’t imagine going back to regular deodorant. I was so hopeful about this product! I do like the scent, and I think it was effective. However, I echo a previous reviewer who stated it feels like sandpaper. Moreover, after my first full day of use I had painful rashes and irritation- as in cool wash rags, topical ointments, and sleeping with the sheets tucked under my arms to reduce the pain. I do have problems with irritation and need to rotate through a few types of deodorant to get a decent combination of effectiveness and comfort, but I don't recall any other type that affected me this bad. I was hoping this would be a great solution for me, but it is unfortunately too irritating for my skin. I was really excited when I received this in the mail and couldn't wait to try it. It was really fantastic at first, mainly I liked the smell and I didn't stink. After about 2 weeks of wear I noticed that both of my armpits got really dark in the area of application. 2 days after that all hell broke loose. I noticed it on the left side first it started out as mildly irritated at first, almost like a razor burn. As the day went on it spread to both pits and got much much worse. It was like hell on earth in my pits. The burning was so bad, I slept with ice packs in my armpits for several nights. Nothing could get rid of the pain and I couldn't wear any deodorant for weeks. Read the amazon reviews before trying this product I am definitely not the minority and wish I would have read them before trying. Thank you for taking the time to review the deodorant cream! It's possible that you have a sensitivity to the baking soda or essential oils that are included in the ingredients. To make the most of your deodorant cream, customer service will be reaching out to you directly with some tips and tricks. Thank you! Zero stars if possible. Most disappointing Mighty Fix shipment so far. I totally agree with a previous reviewer. The paste smells like fish, or more like low tide. Still, I gave it a try, thinking the smell was just because it was concentrated in the jar. But once I started to sweat a little, I started getting whiffs of lemongrass and fish. OMG it was ME! Mortified doesn't begin to describe how I felt. The whole jar went straight into the trash when I got home. Because it's all natural it might react differently to other body chemistries. All I can say is it was a disaster for me. Hi Nancy, I'm so sorry that you had a terrible first experience with the Soapwalla! Soapwalla discovered an issue with the formula in a batch of deodorants and actually found a new production team as soon as the issue was brought to their attention. The smell you experienced was actually due to a vitamin e oil that had been compromised and gone rancid. Our customer service team will reach out to you directly to resolve the issue for you! The formula should never smell off and should always have a bright and refreshing scent. Soapwalla extends their sincere apologies for the production mishap and we are extremely sorry that you received a bad deodorant. We pulled all inventory from our shelves until the issue had been resolved at the manufacturing level, which it now has. Please be assured that what you received was NOT the norm! Our sincere apologies for the inconvenience! I got this as a MN monthly try out, original scent. I hate it. First, I don't care for the smell, it's pretty nasty. Second, I don't like having to stick my fingers in the stuff, as it's tricky to wash off after. I like that it's all-natural, but so is Native, the brand I'm going back to. Also, I don't feel it keeps me smelling fresh, as I do not like the scent (original) to begin with. I gave it to my BF (and he's okay with it), but I won't be getting this again. Thank you for the review! The deodorant cream application does take a bit to get used to. One of the benefits of switching to a deodorant cream in a jar, is that you will be able to use 100% of the contents. Typically, deodorant sticks are thrown away with 10-20% of their product leftover. Also, did you know that you are able to opt out of skincare in the Mighty Fix? Just go to your "My Account" page and fill out your profile. If you have trouble, feel free to contact customer service directly. Had previously used the Soapwalla Sensitive and loved the product so was thrilled when this arrived as part of my monthly fix. Had to discontinue use after the first couple of days because of severe irritation. I would get large, red, rough rashes under my arms and on the sides near my breasts (even though no product was applied there directly) and it made working out horrendous. DO NOT GET THIS DEODORANT! After about a weeks use I have a terrible rash that so far is not going away. I have stopped using it now but its painful. I do not recommend. This caused hugely swollen glands under my arms. I've been using a crystal stick for years with no issues, but when this came as my monthly fix, I decided to give it a try. After about a week, I had large, hard "cysts" in my armpits that hurt when pressed. I immediately stopped using the cream and they went away within a couple of days. Guess there's something in there that doesn't agree with me, but I don't know what it is. I'm not usually allergic or sensitive to much. I received the citrus scent in my monthly Mighty Fix. The smell was citrus mixed with fish, I made my husband smell it to make sure I wasn’t imagining things. I’ll stick to my Schmidt’s deodorant. Used the product for 2 days and developed a rash under both armpits. So disappointed I wont be able to use this product. So much for switching to a "healthier" product.